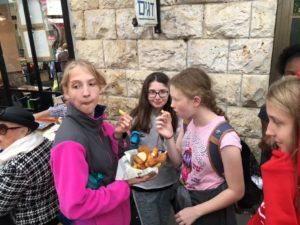 The students returned to the Jerusalem market they visited the day before. What a difference! 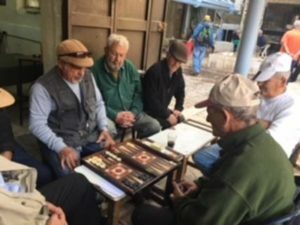 Today Jewish men, who most likely left Iraq in the 1950s, showed up at the market to spend the day drinking tea and playing sheshbesh (backgammon) with their friends. Our amazing guide, Beni, led a food tour through Mahane Yehuda. 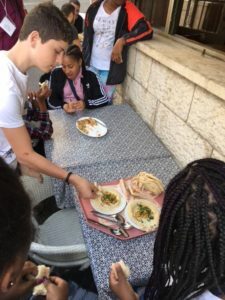 There are so many different countries of origin represented in the Israeli population and today at the market the students got to sample four of those countries’ traditional foods, updated with an Israeli flare. Yes, they’ve had a lot of hummus and some of them didn’t like it. But for those who did, the Iraqi hummus below, which takes 3 days to make, was divine! 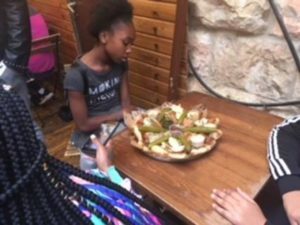 They also ate Burekas, a Turkish savory pastry. The cheese was definitely their favorite! After that, they sampled Georgian (the country not the state) food. You can ask your kids what they thought about it. And last, they had incredible fish and chips. After all the British once ruled mandate Palestine! 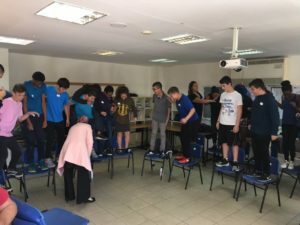 Before lunch at the shuk, they visited a very special school where Jewish and Arab students learn Arabic, Hebrew and English together. (For you principals reading this, get ready for your students demands for three recesses a day!) Moreover, the kids get to run freely all around the outdoor area. Today there was a guest marching band playing music that animated the entire 30 minute break. It was a lot of fun. Yad b’Yad was a perfect setting to begin to explore the Arab-Israeli conflict, including the lack of equality in this democratic state. Many of the students didn’t think it was a big deal that kids from different backgrounds learn together. And the Israeli and Palestinian kids were puzzled by these American kids speaking Hebrew like them. 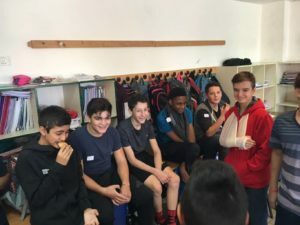 Mostly, they loved spending 2.5 hours with Israeli and Palestinian peers, talking about math, and food, cell phones and music. They also went to the Israel Museum and had a 2.5 hour bus ride to the North. Stay tuned for tomorrow’s adventures!